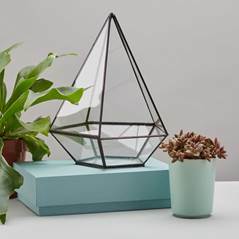 June 2016 Hilton Bankside, one of London’s newest design hotels, is delighted to announce a new partnership with Geo-Fleur, London-based specialists in gorgeous geometric plant homewares and plant design, including the of-the-moment home accessory, the indoor terrarium. Guests of Hilton Bankside and green-fingered locals alike are invited to come and get their hands dirty at a series of Terrarium making workshops, the first of which are to be held in July at The Distillery, the destination bar at Hilton London Bankside. A terrarium is a beautiful, quirky way to display indoor plants such as succulents and cacti to great effect – as seen in interiors blogs and websites including Apartment Therapy. During the workshop, Geo-Fleur will provide everything required to make a beautiful terrarium, including the grit, soil, sand, and a variety of perfectly cute succulents and cacti to create your own miniature garden to take home. Participants just need to bring their chosen vessel in which to create their mini-garden – choose one of the many designs available on the high street or even transform an antique lantern, large jam jar or bowl! There will be advice given along every step of the way from the Geo-Fleur experts on the best way to design your terrarium, how to position the plants, and how to maintain and care for your terrarium once it is enjoying pride of place at home! The Distillery will be offering “buy two drinks, receive the second for 1 penny” at the bar to all Geo-Fleur participants, the perfect excuse to enjoy a G&T or delicious cocktail while you admire your finished creation! Sitting in the heart of vibrant Bankside, The Distillery is located on the site of the old Stevenson & Howell fragrance factory, which distilled essential oils and manufactured essences, flavours and garnishes during the 1800s. 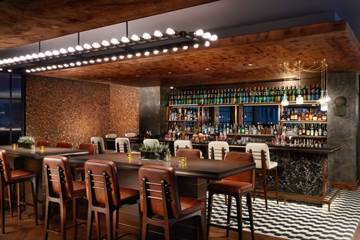 Inspired by this local history, the bar mixes signature cocktails using homemade aromatics, infusions and bitters to accent drinks. The Distillery bar also specialises in craft beers and stocks over 50 hand-picked gins, from fine old classics from every point of the compass, to new age gins from artisan distilleries springing up all over Bankside, Southwark and Bermondsey. The Terrarium Workshop at The Distillery, Hilton London Bankside costs £30 plus VAT per person and lasts approximately 1 hour 30 minutes. Participants must bring a vessel in which to create their terrarium. Check out the Geo-Fleur website for more inspiration. Workshops are non-refundable. Geo-Fleur specialize in all things plant-based: indoor terrariums filled with cacti and succulents, leather, brass and copper hanging planters, ceramic vases, glass air plant hangers, angular wire candle holders and workshops including terrarium making and kokedama. They are soon to be publishing an indoor gardening book with Hardie Grant Publishing, and will be opening a retail space at the east village in Stratford, in collaboration with Get Living London.